Of all Catastrophe’s traumas, the lack of answers is – for some – worst of all. Could such epic suffering one day return? How to prepare for it? Who is friend and who is foe? In this grisly aftermath, a plethora of speculation prospers. But for L 726-8‘s Roswell Division followers, there’s no mystery at all. The answer is evident: a non-Earth-originating lifeform. ‘Aliens’, as the kids call them. Such ideas are not unheard of. But they took particular root here thanks to a Catastrophe survivor and former Jump Gate resident, Robert Lamb. Somewhat spuriously, he alleged discovery of the aliens’ communications on the Mesh, shortly before the Catastrophe. But it was only after the disaster that his ‘paranoid ramblings’ got more serious attention. Lamb’s final post-Cat cycles were spent trying to raise awareness. Over time, snippets and details morphed into a fully-fledged narrative. The aliens’ motive? Revenge for the disastrous old Earth ‘first contact’ incident of 1947 (about which Lamb read patchy accounts as a boy). Back then, alien scouts landed in Roswell, New Mexico with peaceful intentions, only to be met with medical labs, surgical scalpels and death. The lesson was clear: humanity was hostile and had to be destroyed. Except that, despite centuries of preparation, the aliens didn’t quite manage it fully. Humanity survived the Catastrophe. And so, on this unusual Jump Gate, many fear the omnipotent race who might return to finish the job. But they also harbor hope. The Roswell Division wants to somehow atone for humanity’s original error; to persuade these elusive creatures that peaceful co-existence is possible. Visitors to L 726-8 Jump Gate will immediately be struck by the bizarre culture and fashions of this place. These quirks are borne from an unnervingly obsessive dedication to (what they imagine as) the old Earth culture of 1940’s USA. The Division believes that by recreating the conditions which provoked the first contact, they’ll be chosen as the location for the third one. Hence, the slacks. But don’t be fooled by the thickly-gelled hair and nutty outfits favored by L 726-8’s Division members. This is a friendly place only for those who obey the rules. ‘Crimes against community’ are a serious matter. Projecting the wrong image for the supposedly watching aliens is a ‘no-no’. Being nice is not a matter of choice here. So, what does the future hold for L 726-8 Jump Gate? Will the Division’s ‘third coming’ prophecies ever materialize? And how can you avoid the pesky Division preachers that pester you on arrival in the Port? 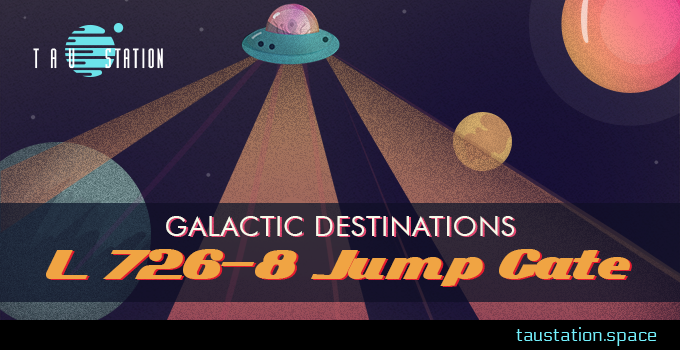 Galactic Destinations has no answers to these questions but, rest assured readers, we’re doing our best to find out!